Roscosmos’ Progress MS-11 uncrewed resupply mission to the International Space Station launched from Site 31/6 at the Baikonur Cosmodrome in Kazakhstan on Thursday. 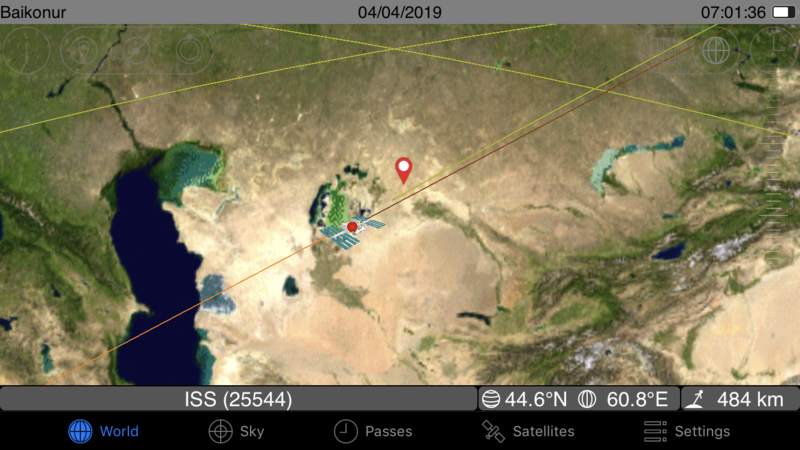 The first Russian resupply mission to the Station of 2019 launched at 07:01:35 EDT (1101:35 UTC) on a two-orbit, super fast-track rendezvous profile with the Station. Progress MS-11 then performed an automated docking with the ISS’s Pirs docking compartment at 10:22 EDT (1425 UTC), just 3 hours 20 minutes after launch. Meanwhile, the Station’s critical supplies – known as consumables – are in excellent shape and well stocked ahead of this Progress mission. Progress MS-11 is the first Russian resupply mission of 2019 to the International Space Station. Progress MS-11 (or Progress 72 as it is known to NASA) is also the 71st attempt of a Progress family vehicle to successfully reach the Station following the Progress 44 launch failure in August 2011, the Progress 59 launch mishap in April 2015, and the Progress 65 launch failure in December 2016. The Progress MS-11 spacecraft bears a serial number No. 441 and was fueled with compressed gases as well as engine and thruster propellants on 19 March following a technical management meeting which cleared the craft for final launch processing. On 29 March, the craft was mated to its stage adaptor (that will attach it to the top of the Soyuz 2.1a rocket) and was encapsulated inside its payload fairing. The following day, Progress MS-11 was taken by rail to the integration hanger where it was mated with the Blok-I upper stage of the Soyuz rocket. The Blok-I stage was then mated to the top of the Blok-A core stage. The Soyuz 2.1a rocket then rolled out to Site 31/6 at Baikonur and was taken vertical at the pad on 1 April. Liftoff occurred at 07:01:35 EDT (1101:35 UTC and 1701:35 local time at Baikonur). At the time of launch, the International Space Station was 484 km southwest of the launch site tracking to the northeast. The single-second launch window is designed to allow Soyuz 2.1a to steer Progress MS-11 into a pinpoint precise initial orbit so the craft can rendezvous and dock with the Station within 3 hours 23 minutes of launch. Had an issue arose during the count that requires a scrub, a recycle to another day would have likely forced Progress to fly a two-day orbital rendezvous to the ISS due to phasing/alignment on the new launch day. Soyuz 2.1a deposited Progress MS-11 into a roughly 200 km circular orbit. The craft’s orbital parameters were quickly be verified by ground controllers once Progress’ communication antennas and solar arrays deployed after separation from the Blok-I upper stage of the Soyuz. Once the orbit was verified and the “go” to perform the super fast-track, 2 orbit rendezvous was given, Progress executed a series of burns to raise its orbit to the 408 x 416 km orbit of the ISS. Progress then performed an automated docking with the Station’s Pirs docking compartment at 10:25 EDT (1425 UTC), just 3 hours 23 minutes after launch. At the time of anticipated docking, the Station and Progress MS-11 were 416 km above the central coast of eastern Australia tracking southeast toward New Zealand. 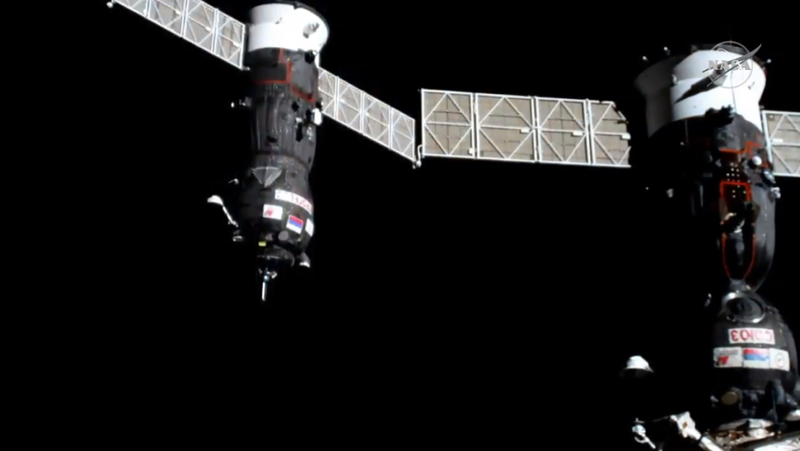 Progress MS-11 transported 3,412 kg of cargo and supplies up to the Station. Even without these supplies, the Station is extremely well stocked. “Right now on Station, [the limiting consumable] would be food, and current data for this moment (no additional resupply) has it with adequate reserves until the end of October 2019,” noted NASA in response to a NASASpaceflight inquiry. This means that even if Progress MS-11 were to fail to reach the ISS, the Station has enough supplies to support a crew of six out to October 2019. A Northrop Grumman Cygnus (NG-11) and SpaceX cargo Dragon (CRS-17) are set to launch on 17 April and 25 April, respectively, with more supplies and experiments for the Station.